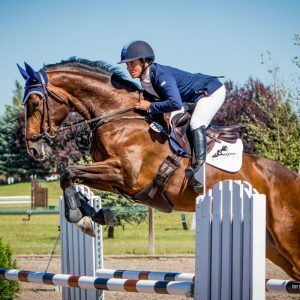 From the age of six, Dani was a member of the United States Pony Club and this is where she found her passion for eventing. She groomed for Amy Tyron, a two-time Olympian, also competing alongside her. Now, Dani owns and operates Aspire Eventing which is based in Larkspur, Colorado. Who is the biggest influence in your career so far? The biggest influence in my career would most certainly be Amy Tryon. I moved to Washington State in 2003 and moved into her barn. She became an incredibly close friend, as well as mentor. Her drive, ambition and talent were amazing to witness and be a part of, it certainly left a lasting impression. I would say I have had so many incredible moments and experiences that it is hard to name just one. Certainly having the honour to have Thurston B Howell as one of my top horses and tackling his first two star ranks up there. We always have room for improvements and the biggest of accomplishments is yet to happen…. Can you share your best advice with us? The best advice I can give is to enjoy the day to day process of training. The showing is just icing on the cake but if you do not enjoy the day to day work, you will always be disappointed with the outcome at a show. I have the short term goal (this year) of piloting Thurston B Howell to a successful finish in a CCI** and competing Bellissima in the 5 year old YEH Championships at Fair Hill. My long term (hopefully not that far away!) goal is to take one of my current horses to Land Rover Kentucky CCI****. I have groomed there for Amy Tryon and truly have the aspirations to to be a successful four-star rider. Thurston B Howell: 12 year old, TB, Gelding. He is owned by Carol Mavrakis of Banner, WY, who bought him from a polo farm, where he was a polo pony. Carol started his career in eventing and competed him successfully through novice. He came to me two years ago, where I was able to move him up the levels quickly. He is only 15.1 but an absolute power house! Every ride he gives me 110% effort and is a machine cross country! He is a barn favorite as he is very sweet and gentle on the ground. Bellissima: 5 year old, Oldenburg, Mare. She was bred by my friend, Amy Bowers, and thank goodness she didn’t grow taller than 15.3 because that’s how I ended up with her! Amy said she was too small for her and called me about her last year. It was love at first sight and I couldn’t be happier with her. She is a sassy little mare who is excessively talented and fancy. She started her career this February in Florida and has been very successful, already moving up to training level. She is qualified for the 5YO YEH Championships and will plan to compete at the East coast championships. Film Shot: 9 year old, TB, Gelding. “Finn” came to me from Florida this March and was bred by Courtland Farms and is owned by Mel and Mary Sloan. He had a short but successful race career and then was retired at the Florida farm as a 5 year old. His dam, Film Maker, was over a $2 million race horse. Finn started his second career with me in March and has been an absolute dream to work with. He has done a few BN events and will go back to Florida with me this winter to really get his career going. What’s most important to you when buying a horse? The most important thing for me when buying a horse is conformation and temperament. If they are built well, they tend to hold up better to the workload. But more important than their build is their work ethic and desire to do the job asked. Do they give you their 110% every day? Do they enjoy their job? It is a very true statement that you cannot make a horse do something they truly don’t have the desire to do. Horses that are successful race horses enjoy running. Horses that are four-star eventers love to run cross country. These are things that are not forced, they are either there or not. What are your favourite Shires Equestrian products? My favourite Shires products are the ARMA Cross Country boots! I have little horses (finally – I used to only have 17hh and up horses until two years ago and I am only 5’1″!) and finding good, quality boots that fit little legs was really hard. ARMA makes a cob boot that fits my ponies perfectly! And they don’t cause rubs, which has always been an issue in the past. I love the protection they offer!